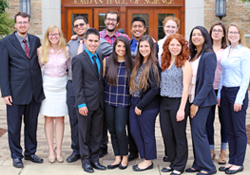 The Department of Biological Sciences at the University of Notre Dame is sponsoring a NSF Research Experience for Undergraduates (REU) program during the summer. The focal point of the proposed projects is Integrative Cell and Molecular Biology. The program consists of 10 weeks of full-time research, a research proposal process, a weekly seminar program, regular group meetings in their research labs, special workshops on career choices in the sciences, integrative research, ethics, and scientific communication. Lastly, participants will give a formal presentation at the end of the summer in the REU Summer Symposium. The award consists of a $5,500 stipend and includes lab supplies, housing on campus, meals, and travel up to $500. Current freshmen, sophomores, juniors and non-graduating seniors majoring in biological sciences, who are U.S. citizens or permanent residents, are eligible to apply. Underrepresented minority students, disabled students, and students from small colleges without graduate biology programs are encouraged to apply.